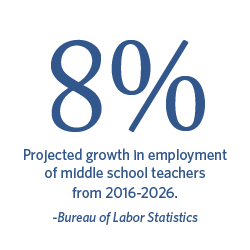 Add Teaching To Your Future. Love math and want to teach young minds? Regent's Bachelor of Science in Mathematics—Secondary Mathematics Education will prepare you with the knowledge and skills needed to seek licensure and teach math for grades 7-12. Strengthen your skills in math theory and practical application while also learning about child and adolescent development, classroom management, and technology used by professional educators. Cultivate your teaching skills through practica and a student teaching internship. Study of current practices in teaching mathematics in secondary education. Emphasis is on current issues, research literature, and the role of technology in mathematics. Teachers will also explore how to teach mathematics to diverse learners. Study of current practices in teaching mathematics in secondary education. Emphasis is on the use of best practices with emphasis given to mathematics discussions, writing across the curriculum, ability to analyze data to improve student performance, the relationship among assessment, instruction, and monitoring student progress, the use of media and computers, and methods of improving communication between school and families. Majors seeking initial licensure in the Commonwealth of Virginia with an endorsement in Secondary Math Education need to complete the Math courses required for the secondary education concentration. Students will also need to be formally admitted to the Teacher Preparation Program and therefore complete UIS 200 (Orientation to Teaching) and pass the Praxis Core (Reading, Writing, Mathematics) Examination, preferably during their freshman year. Before being admitted for student teaching, teaching candidates should complete the required education courses and all required major courses, maintain a minimum of 2.7 GPA cumulatively and in the major, and take and pass the Virginia Communication and Literacy Assessment (VCLA) and Praxis Mathematics Assessment. Information on applying for admission to the Teacher Preparation Program can be found on the Teacher Education and Interdisciplinary Studies website. Students should meet with an academic advisor once per semester to stay on track with licensure program requirements.